Our range of products include spring and lock washers. 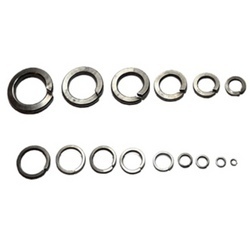 We manufacture and stock Spring and Lock Washers. These washers and are available in Flat and Square Sections. Special Washers can be manufactured as per I.D., O.D. & thickness requirement, as per drawing and sample provided by client. Material in Stock: - Mild Steel(M.S. ), Stainless Steel (S.S.) grade 202, 304, 316, Brass. Looking for Spring & Lock Washers ?